With just weeks left before Minnesota regulators decide the fate of Enbridge Energy's contentious Line 3 oil pipeline proposal, activists are gearing up their years-long fight against the project. 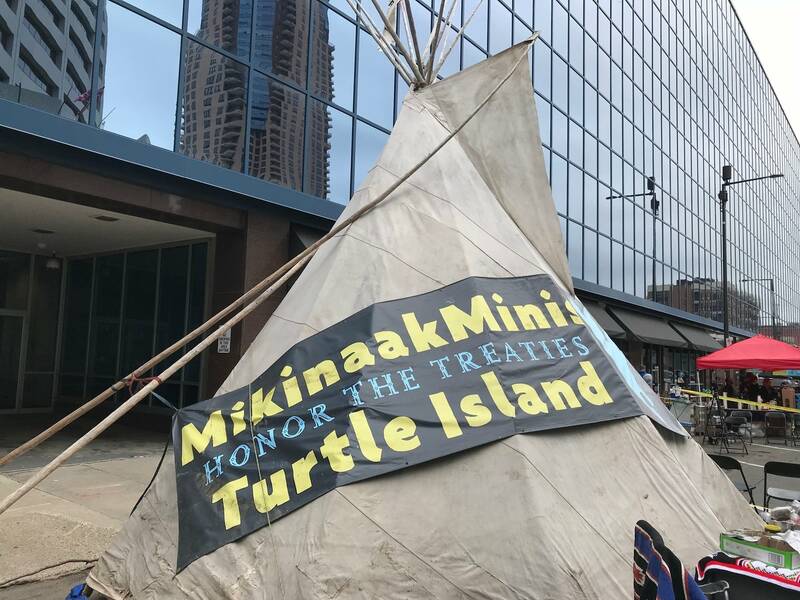 A cadre of environmental and tribal groups camped in downtown St. Paul on Friday and Saturday for an anti-Line 3 rally and to take pledges from people who promise to continue fighting the pipeline, if it's approved. "The pledge of resistance says that we stand united against this proposed pipeline because of the threat it proposes to our air, our water, wild rice, Anishinaabe treaty territory and our climate," said Akilah Sanders-Reed, a climate activist. "As one of the dirtiest kinds of oil on earth, tar sands oil contributes to climate change more than any other kind of oil." The activists' camp was outside the Public Utilities Commission's office. The agency's five commissioners will have final say on whether to give Enbridge the necessary permits to build Line 3. Sanders-Reed said it was crucial to bring the anti-pipeline message right to the commission's doorstep. "We know that the public utilities commissioners are suposed to be making decisions that benefit the people of Minnesota. And so we're here outside their offices throwing this celebration of resistance to show them the world we believe in," she said. The pipeline would take crude from Canada's oil sands region and zig-zag across northern Minnesota toward the southwestern tip of Lake Superior near Duluth. Enbridge wants to replace its current Line 3 along a new route across northern Minnesota that avoids reservations but still travels through sensitive natural areas, including the Mississippi River headwaters and wild rice waters. For Rose Whipple, a 17-year-old climate indigenous-rights activist, that's not OK.
"Sometimes when I'm at home and I really think about it, I start to cry because I don't wanna think about what would happen if this goes through and what those communities up there would have to face. Their wild rice is at risk." And the risk of oil contaminating wild rice waters, she said, threatens the Anishinaabe way of life in northern Minnesota. This weekend's rally included art, a concert, a wild rice meal and a water ceremony on the Mississippi. It wrapped up Saturday with a "direct action training" for people who pledged to resist Line 3. Organizers kept a reporter out of the training due to participants' fears of a bill under consideration at the Legislature that would increase penalties for protesters. The Public Utilities Commission has set four days of hearings and deliberations next month on Enbridge's proposed pipeline. An administrative law judge last month recommended that Line 3 get regulators' approval, but only on its currently location — not on the new route that Enbridge prefers. The Leech Lake Band of Ojibwe said that non-binding recommendation was "a clear attack on sovereignty and tribal communities."